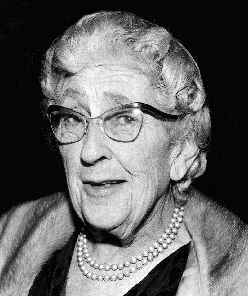 Christie, born Agatha Miller in 1890, began writing at an early age, despite her rather unconventional mother. Christie's mother, Clara Miller, believed she was a psychic and that Christie and her siblings would be best served by not learning to read or write until they were older. However, Christie was highly interested in reading and taught herself at a young age. She read widely and devoured such authors as Lewis Carroll, Edith Nesbit, and Mrs. Molesworth. She wrote her first poem “The Cowslip” when she was around ten years old. After completing finishing school in 1910, Christie and her mother moved to Cairo, believing that the warmer climate would help ease her mother's sickness. It was in Cairo that Christie first began making real strides toward establishing a career as a writer. She wrote poems and plays, which she and friends performed. It was around this time that she also wrote her first short story, "The House of Beauty", while recovering from an illness. Though she had no real desire to make a career of poetry or theater, she did seek publication for this and subsequent stories. All her stories received rejections. Some were later published, like "The House of Beauty", renamed "The House of Dreams", and "The Lonely God", both of which were collected in While the Light Lasts and Other Stories. Christie completed her first novel when she returned to England. The novel, Snow Upon the Desert, was also unanimously rejected by publishers. World War I broke out in 1914, and Christie married her first husband, Archibald Christie, a member of the Royal Flying Corps. Christie herself joined the war effort as a member of the Voluntary Aid Detachment, volunteering over 3,400 hours of her time as a nurse. Eventually, she became an apothecary's assistant and worked for pay. It was these experiences during the war that actually led Christie to her first publication. Inspired by the Belgian officers she cared for during the war, as well as her extensive knowledge of medications and poisons learned working for the apothecary, she decided to marry these bits of personal experience with her own great love of detective fiction, like those of her literary heroes Wilkie Collins and Sir Arthur Conan Doyle. Her novel The Mysterious Affair at Styles was rejected by several publishing houses but was eventually released in 1920 by The Bodley Head. The novel served as in introduction to one of literature's most important detectives: Hercule Poirot. More novels followed in the years to come. While Christie's professional life was finally beginning to flourish, her personal life was another matter. In 1926, Archibald Christie requested a divorce, wishing to begin a life with his mistress. 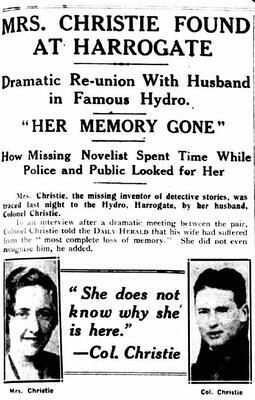 The couple fought and what happened next is probably the greatest mystery in her life: Agatha Christie disappeared. Her car was found near a chalk quarry and fearing the worst, police began an extensive manhunt, even searching the surrounding area with airplanes. It took ten days to find her in a hotel where she was staying using her husband's mistress' surname. Christie said she did not remember anything from the past ten days and two separate doctors confirmed a diagnosis of amnesia. Christie did not include this event in her autobiography and it remains one of literature's more enduring real-life mysteries. After Christie's divorce, she continued to publish novels and short stories, and in 1928 met her second husband, archaeologist Max Mallowan. Her travels to various places with him on archaeological digs ignited a passion for the subject, and the locations greatly influenced her work, as seen in one of her most famous novels, Murder on the Orient Express, which takes place on the train she and her husband often took to travel to the Middle East. Christie's work continued to evolve due to personal experience after World War II. During the war, she worked at a pharmacy in University College Hospital and learned even more about poisons. In fact, she featured thallium poisoning in her novel The Pale Horse with such scientific accuracy that it allowed a nurse to correctly diagnose a child as having been poisoned. Christie continued to write through the rest of her life, in spite of failing health. Her final book, Sleeping Murder, was published in 1976, the same year as her death, and other works have been published posthumously. Throughout her life, Christie was awarded numerous honors and titles. She was promoted to Dame Commander of the Order of the British Empire. Her play The Mousetrap is the world's longest running play, and she is the best selling novelist of all time. Her works have been adapted into radio plays, television programs, movies, and video games.